Breithorn (4164 m) is one of the giants in the Zermatt area in Wallis, Switzerland. 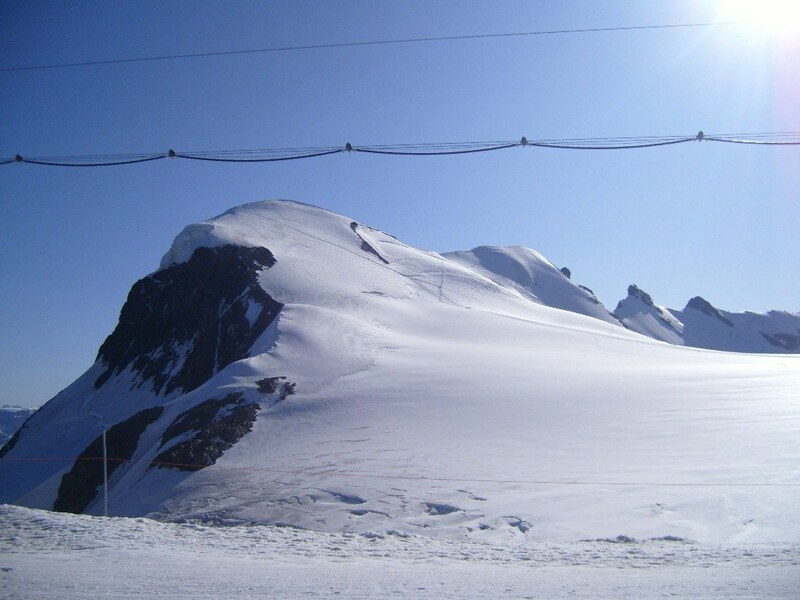 Nowadays, climbing Breithorn is just a simple glacier walk from Klein Matterhorn lift station. This route is described here. Breithorn Zermatt is a 4000er for every respect. It is completely covered with ice and glaciers from every side. Its summit is a huge glacier dome, but with a relatively easy access from the southwest side, which is still inside the Swiss territory. 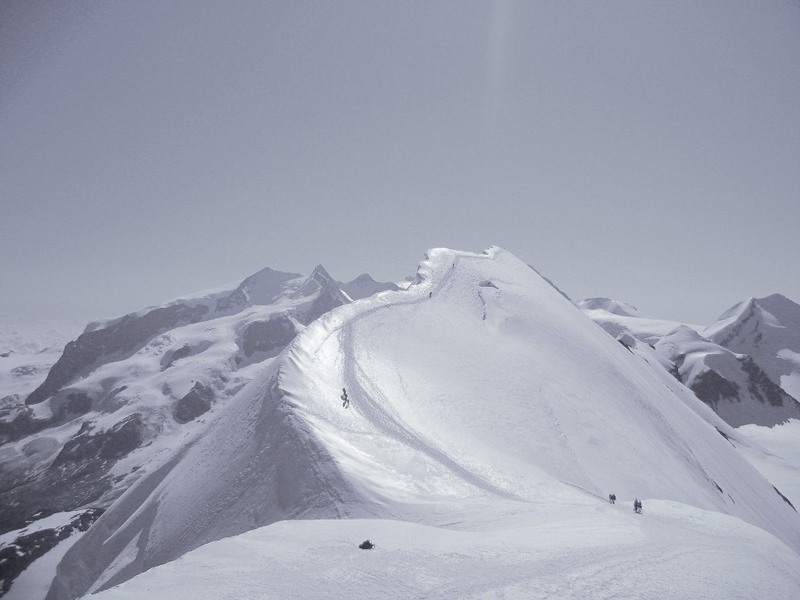 But when you are on the glacier you will be walking practically along the Swiss-Italian border if you approach the summit of Breithorn by making an anti-clockwise direction loop. Breithorn Zermatt – view from the route to Platthorn. Thanks to the lift from the Swiss side, you will get very easily to the altitude of around 3800 meters. But you will pay a lot for this, in 2009 the ticket was no less than 50 Euro. And the lift is always full. There is a restaurant at the upper end of the line and the area behind the upper station is a ski paradise all the year round. You can thus enjoy skiing at around 4000 meters even in summer time. So if you use the lift, there will be no much of a climb when you start your journey from Klein Matterhorn station, it is just a long walk. 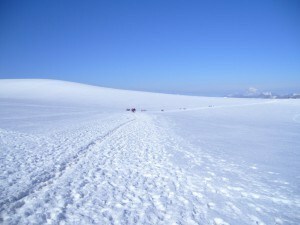 You will make a big loop along the glacier, first walking in the south direction along the ski runs, and then turn to the southeast and to the north in the end. The reason for this are crevasses which you will see on your left side. In the description of my climb elsewhere, I pointed out how crowded this mountain was. This is of course due to the lift. If people would have to climb it from Zermatt, this would be a completely different story. In the present circumstances, you will have to manage only around 350 meters of the height difference and to walk around 2 and a half kilometers over the glacier. The final slope is probably around 35-40 degrees. So you will definitely need crampons, and if you are in a group you will use a rope. The approach from the east follows a rather sharp crest before the summit. But do not underestimate the climb, this is a very high altitude and you will feel it in every step you make there. 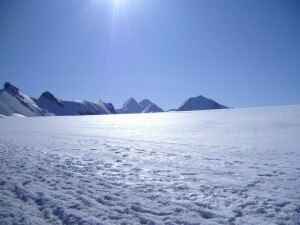 View from Klein Mattarhorn station, very much foreshortened, in reality it is higher and steeper..
View toward the east. A pale photo, something was wrong with the camera. Stiff sole boots for crampons. Harness and rope if you are in a group. Note, the type of boots depends on the type of crampons, read more in my separate text. Breithorn Zermatt is the only mountain where I used the lift. Yes, I admit this, and I am far from proud of it. Reasons: lack of time, and a bit related to this, a lack of confidence. Normally, I walk from valleys, you may read about similar mountains where I did just that, Weissmies and Lagginhorn. 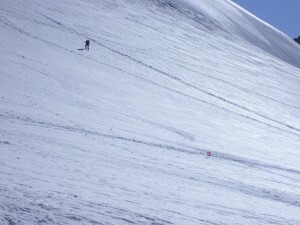 But in the case of Breithorn, the access route from Zermatt is far longer. This is because it represents a long loop, it goes first to the south, totally behind the massif of Klein Matterhorn and Breithorn, over Plateau Rosa and Breithorn plateau, and then to the north toward the summit (see the map provided above). 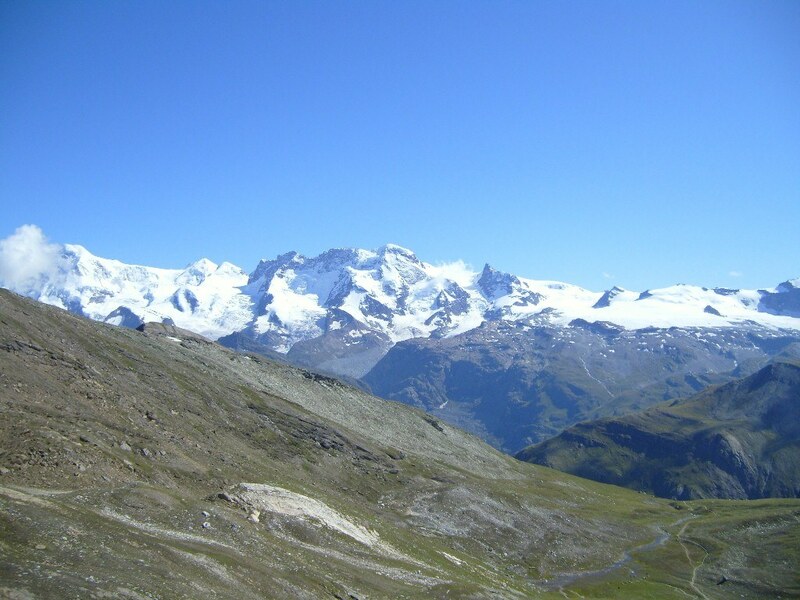 And the height difference is more than 2550 meters; but see at which altitudes, from around 1600 m in Zermatt to 4164 m at the summit. So, I was not sure if I could manage it in one day even if I would not sleep, like in the cases of my climbs to Weismiess and Lagginhorn (and many other mountains, in fact, see for example my pages about Teide, Fletschhorn, and Fuji). 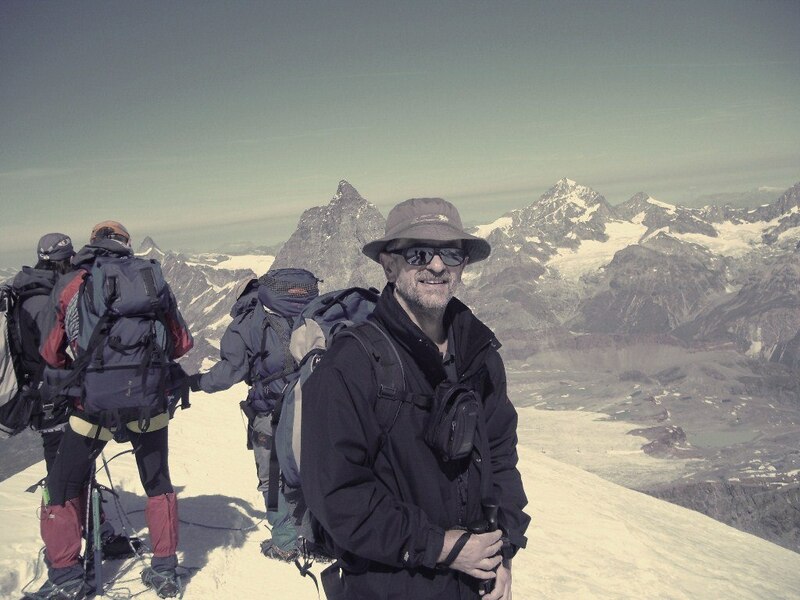 Me on the summit, Matterhorn in the background. Due to these reasons, in summer 2009, I took the first lift in the morning from Zermatt and after some 20 minutes, I was at the Breithorn plateau. The photos above depict what I saw that morning. I put crampons and started my tour. I approached the summit from the east and walked the sharp crest which you may see above. There were already many people on the summit. The magnificent Matterhorn was at a stone throw, and it did not look so high from there. After about 20 minutes or so, I started descending along the other, west route. Many groups were on their way up so at some places I had to step aside the route to let them pass. This is an example of mass mountain tourism. If you want to experience solitude in mountains, this is not a place for you. Some groups were of 12-15 people, so tightly roped that they hardly had enough space in between them to make longer steps. It looked really ridiculous to me, and it seems the same feeling had the guide of one of the groups. But he was making a good money, so all was good for him. But one guide was working hard: he had only one customer, obviously with a deep pocket, a rather heavy women who simply could not walk. Instead of leaning forward, which is normal when you go up, she was actually leaning backward. So the guide was really earning his money that day; he and the rope between them were the only things that kept her from falling back. It was a tugging in the real sense. To summarize, if you disregard these details related to the crowd, climbing Breithorn is still a great experience. Do not try to go without crampons. If you go solo, stay on trails. Crevasses are there even if they are not visible all the time. Here is yet another story about Breithorn, just in case you are collecting information before going there yourself. If you need accommodation in this part of the Alps, I suggest visiting my another page where you will find information on how to rent a holiday flat. Comments will be greatly appreciated. I shall be happy to answer any question. My wife and I have been to Zermatt two times where we have done the standard hikes like the Matterhorn glazier trail and the hike down from the top station at the Rothorn as well as the 5 lakes and various other ones. Never done anything like this but last time we said we really wanted to do it. We have looked at Zermatters guided tour. Would they be a good option? They go in groups of 6 and it reads really well saying we didn’t need experience just reasonably fit and to hike in high altitude surroundings for a few days prior. I am 52 and my wife is 49 and reasonably fit. Would it be suitable for us. Hi Shaun. I am not familiar with guides there, but this is a mountaineers’ Mekka so they must be reliable. They would take you by the lift and the rest is just a simple walk. So I wonder if you need a guide, the route is visible all the time from the lift station. There are many people there all the time. But if you feel safer in such a group, go for it, this is indeed a glacier walk and there may be hidden crevasses. Yes, you will be able to do this for sure, I am older than you. Crampons are necessary, just to know. I am using this opportunity to write something and submit here in the site, I have an open invitation for guest authors. Hi, this mountain is permanently under snow and ice so the season should not matter really. The area around is a skiing zone even in summer, so I expect that there will be many people around and most likely many will be going to the summit as well. But I have not been there in the winter time and cannot say more. I guess you will take the lift to the main plateau where all skiers go, so you will see how it is. 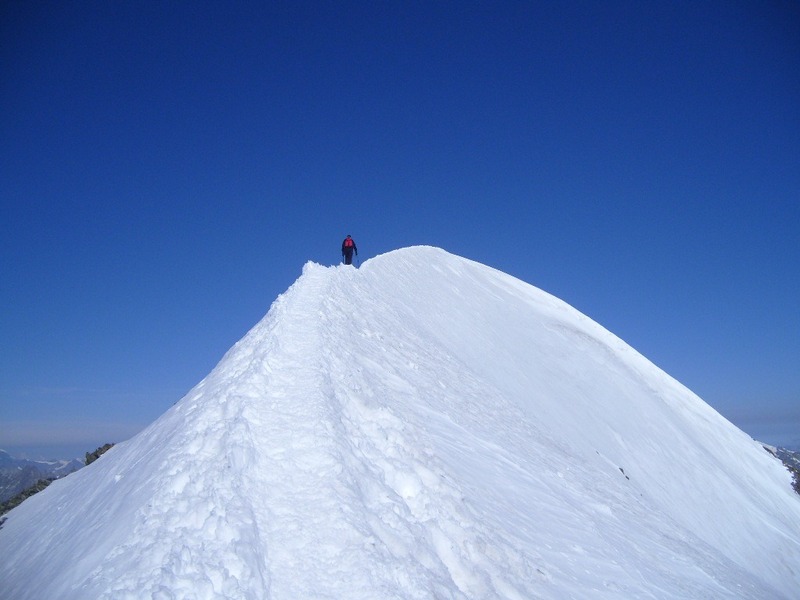 The summit is very close and the route is visible all the way to the top. Just make sure that you make a long loop around the zone full of crevasses. Good luck. If you wish, please write something and submit here in the site, I have an open invitation for guest authors. Great photos and description of the climb. I am going to Zermatt in late November, and am trying to see how doable this climb would be. Fully equipped and knowledgeable in the use of alpine gear and travel, but have not been to the area before. Do you believe this would be a reasonable climb during this time of year? Hi Trevor, great to hear from you. If you use the lift as most people do, and if there is no much new snow, this will surely be doable, you see the summit all the time and do not need a guide. But this is a glacier with crevasses so keep on the trail if there is any. Go clockwise approach, it is less exposed. You never know about the snow. I was in the Alps in August and had snow storms as you can see from this article about Cima Solda. There are web cameras at many places so you can get some idea. I usually check the Stelvio pass camera which you have in my text here close to the beginning. It is far from Zermatt but it is relatively high and you can get some impression about the Alps situation. You need stuff for glacier walk but you have it already and with your experience you will be fine. I was solo and did not feel great on the glacier but there were many people around and that gives some feeling of safety. Let men know how it was when you come back. You can add some text to the site if you wish, it would be useful for others. Here are some instructions. I’m planning to go to Breithorn from the Klein Matterhorn lift station, but next I would like to go down to the nearest shelter (I was considering Refuge Guide d’Ayas), stay the night there and climb Castor the other day and come back down with the lift. 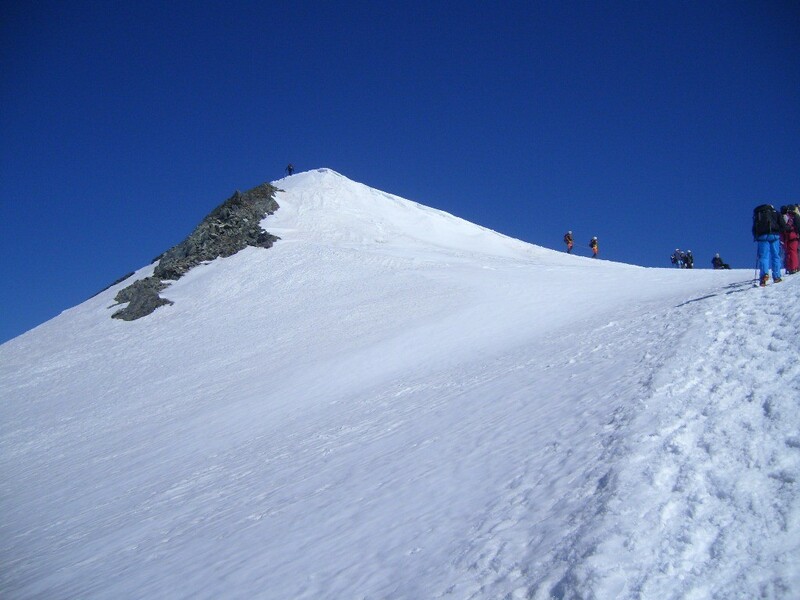 Do you think it would be possible to get to Refuge Guide d’Ayas from Breithorn? I cannot find any information about the route distance nor the time and would appreciate some advice on this. Hi KJ. I did not go to the Italian side and do not have first-hand info about that hut. But I know that it serves as a nice start point for the climbs you plan. Note that there are many hidden crevasses and going to Castor solo is dangerous. A better option is to stay in the dormitory which is directly at the Klein Matterhorn lift station. I did not use it but I know it exists so people stay there. 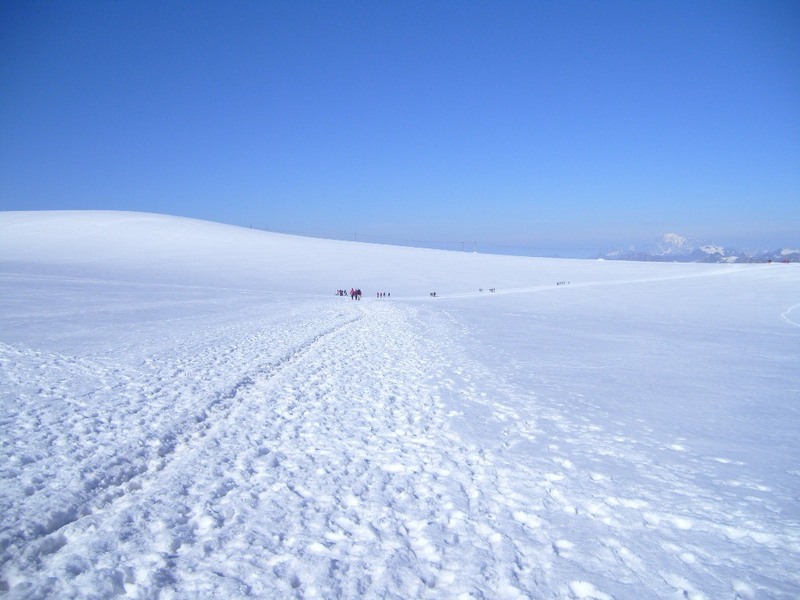 Are the paths clearly marked in the glaciers to avoid Crevasses? Would like to do this late September. I do not remember any marks at all. It is just a wide trail in the snow that you can follow regardless which approach you take. Glad I stumbled across this site. I’m looking to climb my first 3000 or 4000 mtr mountain and thinking the Briethorn might be good to start with. Will it test you on how you deal with altitude sickness and is it possible in February? I have winter experience in the Scottish hills. Hi John, thank you visiting the site. I do not go to the Alps in winter, the snow is too high and going high is impossible and unreasonable. But Breithorn is a specific case. They have skiing there all the year. There is a lift which will take you to 3800 meters, many ski areas are around. So going to the summit from the skiing areas should be a simple task. Berithorn is a magnificent mountain but all this touristic stuff around have destroyed it. Regarding the altitude effects, there is no way to predict how the body will react. This is all individual and may change in time. I climbed Teide on Tenerife 6 times, with normal altitude effects in the first 5 climbs. But the 6th time I did not know what happened, hardly managed to get to the summit, I felt half-dead. 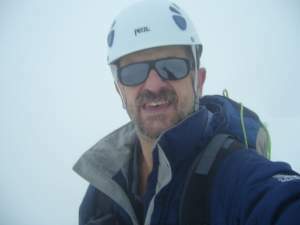 On Berithorn, I did not have any particular symptom, just normal lack of oxygen, you feel tired, etc. You can read about symptoms in this text. Jovo, thank you for that information. Is Teide possible in February? Thats when my next week off work is. Hi John, great to hear from you again. Teide is my favorite. In principle it is with very little snow in winter time, if any. But last year in April we had snow over knees. Though, this is not so typical. It can be icy of course, so it is best to see when you are there. If you have any traction tool, bring it with you. The mountain can be climbed all the year, there are no seasons there. If you decide Teide is not for you this time, then there are many more options. Pico Viejo and Guajara will be without snow for sure. I have described some of them in the site, just visit the Tenerife page, you will see hiking and climbing tours. Let me know if you need some details. Many tours I did not put in the site, did not have time, plan to do this some day. I spent one year on Tenerife and have passed every route in Anaga mountains, some of them multiple times. This is a rain forest, and February is great time to be there. Have a waterproof jacket, you are from Scotland so you must have it already. Hi Nic, thank you. I have been to Oberrothorn some 13 years ago with my daughters. This is a high mountain in every sense, but being surrounded with so many 4000ers, it looks small. Thank you for kind words. Hi, I assume you plan to go to Breithorn Zermatt. I have my own equipment so do not know about renting stuff in Zermatt. But this is a mountaineering capital so most likely you can do this once you come there. You can also buy such equipment in Zermatt. There are several types of crampons, each designed for specific kind of boots. You may have a look in my post about it. You need crampons for sure but you can manage without an ice axe, though I would not go without my axe. Sorry that I cannot say more. Great post! What an amazing hike. I have never been on a 4000 m mountain peak, only 2000 meter ones. This summer I went on a hike in Norway to four 2000 meter tops in one day. I love mountain hiking and can’t wait for my next trip. I love reading about your journeys. Keep up the good work. Hi Andreas, thank you, great to read your comment. But I must say that I would not use the word hike here. What an amazing site that you have! I have to say, I’m envious of your adventures. Being in Florida, USA, I am probably able to jump over the tallest hill in the state. But I come from a very mountainous state in CA and absolutely love being in the mountains. I really liked the photos and videos as well – just beautiful. How much experience should one have to attempt a climb such as this? Hi Kevin, thank you for visiting my site and for the comment. For this particular climb, if you are ready to pay a guide you do not have to have any experience, although this is a very high mountain. It is because of the lift which takes you to 3800 meters above the sea level. But if you go solo then you must be familiar with the use of crampons and have some experience with glacier walks. Well, a 50 Euro for a ride! Not bad. But, if there are some facilities there and if skiing is possible, as you say, even in summer time, it`s not strange that is always full. Amazing work you give here. With some incredible descriptions. I am glad that you placed so many pictures, it lifts up the experience, since I am not a climber. Thank you Igor, great to read your comment. Yes, the area is at 4000 meters and skiing is all the year around. Many thanks Lavera, I am happy that you enjoyed the site. Beautiful views up there Jovo! Your site has given me the feel of it as I was there. The adventure looks great, I loved the pictures and I shared with Pinterest, my favorite social media and to Facebook. Your passion for your hobby is so clear, I wish you all the best. Wow , the view is just amazing ! This should go into my bucket list !